When it comes to their young child’s health, most U.S. parents aren’t taking any chances. 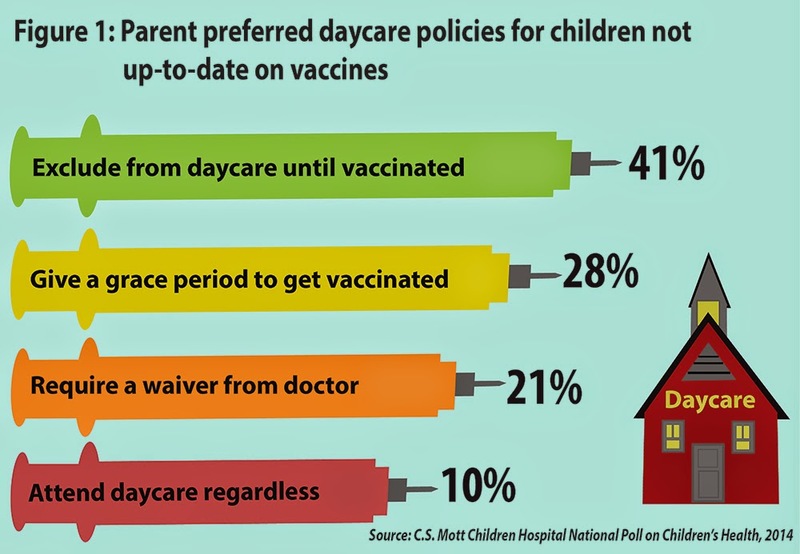 A vast majority of U.S. parents (81 percent) either agree or strongly agree that all children in daycare facilities should be up-to-date on their vaccinations, according to a C.S. Mott Children’s Hospital National Poll on Children’s Health. Another 74 percent of parents either agree or strongly agree that day cares should keep up with the kids’ vaccination status on a yearly basis. If a child is not up-to-date on vaccines, 41 percent of parents polled said they would want the daycare to exclude the child from the facility until he or she is vaccinated, 28 percent would allow a grace period for the child to get vaccinated, and 21 percent would require a waiver from a doctor. Only 10 percent of parents said they would be OK with an unvaccinated child in their kids’ daycare. Texas law requires that children in child care facilities meet the minimum state vaccination requirements. Texas goes one step further to protect children’s health by requiring licensed child care centers to create an immunization policy for their staff.